Chalet Morzine is in an absolutely fantastic location for you and your family and friends to enjoy the best of the summer in Morzine. On a slightly elevated position in the centre of town, the chalet affords spectacular views over the whole of Morzine village. This is a fabulous unique spot; quiet & tranquil, with no town centre noise, yet just 2 minutes walk away from the first restaurant and all the shops, bars and summer activities that Morzine has to offer. 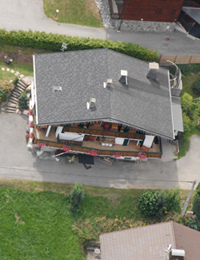 Families with small children will really enjoy the close proximity of the chalet to all that Morzine has to offer. Only a few minutes walk and you are in the village square. Really handy to just pop in and out; a ride on the carousel, an ice-cream, then back to the chalet in no time. Such a private location too ensures real safety in letting the children have a bit of freedom to run around the chalet and the outside. Being on a cul de sac and private road, with only a wild field in front, means no cars around (except maybe your own). So with the empty field in front, horses running around on the field behind, as well as the stunning garden and decking area, the children can have all the outdoor freedom they want in our unique Alpine retreat. For mountain bikers and walkers we are located just near the Supermorzine lift and Pleney lift, so hardly anywhere to cycle/walk before you are up and away onto the Portes du Soleil lift network into the fantastic Morzine-Avoriaz and Les Gets mountain area. The elevation of Chalet Morzine affords the most spectacular views over the whole of Morzine village and the mountains. All the bedrooms, lounge and kitchen have balconies so you can appreciate the breathtaking Alpine scenery from all angles. The outdoor terrace and the indoor dining area afford wonderful views whilst eating and the views from the outdoor hot tub are fantastic, especially as the sun is going down. As we are well set back from the main road, with a huge empty field in front, we have no town centre noise either. Totally peaceful, yet so close to make the most of your Alpine summer holiday.